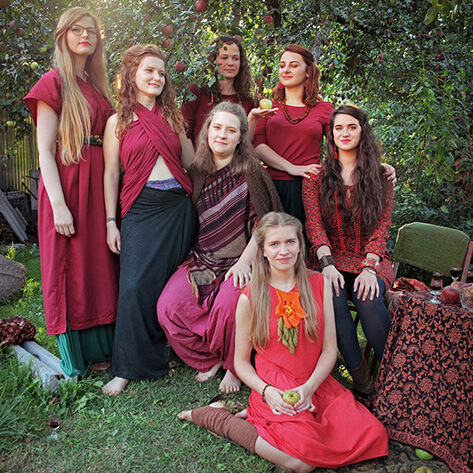 Formed in 2013, Laboratorium Pieśni (Song Laboratory) is a group of female singers from Tri-City (Poland), known for traditional and polyphonic singing, they are also proficient in a capella singing as well as with shaman drums, Shruti box, Kalimba, flute, gong, Zaphir and Koshi chimes, singing bowls, rattles etc. They create new space in a traditional song, adding voice improvisations, inspired by sounds of nature, often intuitive, wild and feminine. Laboratorium Pieśni, apart from singing and participating in festivals, also conducts field researches to find new-old music, looking for songs in their place of origin. The founders of Laboratorium Pieśni: Alina and Kamila Bigus are leading the project ‘Akademia Laboratorium Pieśni (Academy of Song Laboratory) in the University of Gdansk and are also co-organising the festival Etnowiosnowisko. Voices: Alina Jurczyszyn, Kamila Bigus, Lila Schally-Kacprzak, Iwona Majszyk, Magda Jurczyszyn, Klaudia Lewandowska, Alina Klebba, Karolina Stawiszyńska.